Final Fantasy developer Square Enix has shown itself to be a stickler for delicious food and drink through its numerous restaurant projects, and that commitment to quality continues with the Final Fantasy whiskey, which is produced by renowned Scottish distillery Glenfarclas. 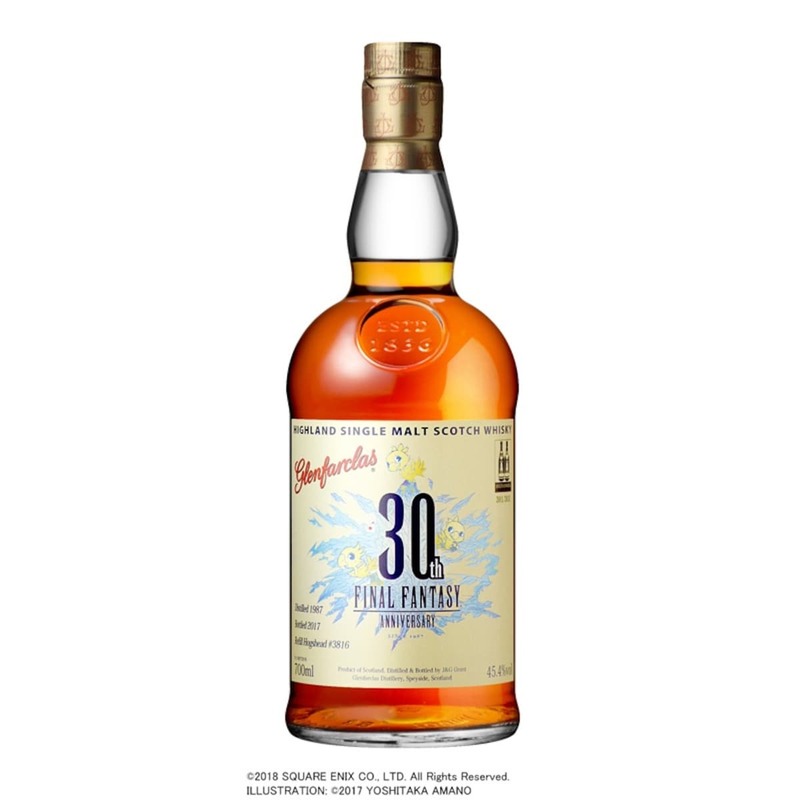 The single-malt refill hogshead was originally distilled in 1987, the same year as the Japanese release of the initial Final Fantasy’s release for Nintendo’s 8-bit Famicom, and the label bears the elaborate Final Fantasy 30th Anniversary logo created by original series character designer Yoshitaka Amano, featuring chocobos, crystals, and even a semi-hidden moogle. Production is limited to 303 700-milliliter (23.7-ounce) bottles, each priced at ¥37,000 (US$330). While that might initially seem like a blatant case of fleecing Final Fantasy fans through a mixture of wallet-prying nostalgia and manufactured scarcity, 30-year-old Glenfarclas often sells for over US$350, so in this case there doesn’t seem to be any premium pricing due to the video game tie-in. In addition to reserving a bottle directly from Shinanoya branches, the company will begin taking preorders online through its website (which boasts that international shipping is available for most products) on January 26, 2018. Any bottles not presold by February 2 will then be offered for immediate purchase, but odds are they’ll all be snatched up before then. So if you’d like to sip the Final Fantasy whiskey while playing your favorite game of the series, your best bet is to act fast.